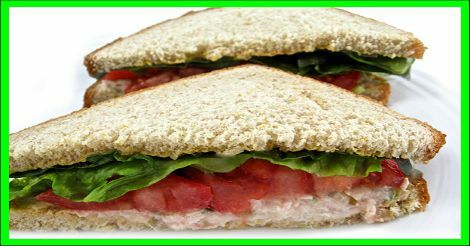 The tuna sandwich is probably the mainstay of almost everyone’s childhood in America. It seems everyone likes the kind of tuna their mom made. Many years ago when I had my restaurant, Nancy’s Healthy Kitchen, I made this recipe. I never thought it was anything unusual other than healthy. It’s the recipe I’d been making at home for years. But, I had several regulars who ordered it almost every day and raved about it. The pickle relish really adds flavor and allows you to use much less mayo than a typical recipe. The skinny on this popular sandwich is 346 calories, 6 grams of fat, 7 grams of fiber and 9 Weight Watchers POINTS PLUS. A 6-inch Subway tuna sandwich has 530 calories and an astounding 31 grams of fat! Even though they prepare their tuna with reduced-fat mayonnaise, they add way too much! One yummy sandwich is perfect for a simple lunch and works great if you’re brown bagging it. 1. In a bowl, add the drained tuna, mayonnaise, pickle relish and mix together. 2. Spread one side of each slice of bread with mustard. 3. On top of the mustard side of two pieces of bread, divide the tuna and spread on bread. Cut tomato slices in half and place on top of the tuna. Top each with lettuce and place the remaining slices on top, mustard side in. Cut in half and serve or wrap in plastic wrap and pack for lunch. Tuna fish is a member of the mackerel family. It’s found in warmer waters in the Indian, Pacific, Atlantic, and Mediterranean oceans. Tuna’s probably the most popular fish used for canning today. About 3.5 million metric tons are fished commercially each year. Tuna is great lean protein when packed in water. It’s rich in omega-3 nutrients, known to raise HDL (good cholesterol) and lower LDL (bad cholesterol). There’s plenty of fiber in the multi-grain bread. Milton’s Multi-Grain Bread is sold in most large supermarkets along with Trader Joe’s. I love to serve tuna sandwiches with a handful of carrot sticks and a handful of baked potato chips. One of my favorites, Ruffles Baked Cheddar and Sour Cream!